Mini make-over of the dining nook with Riviera Maison. 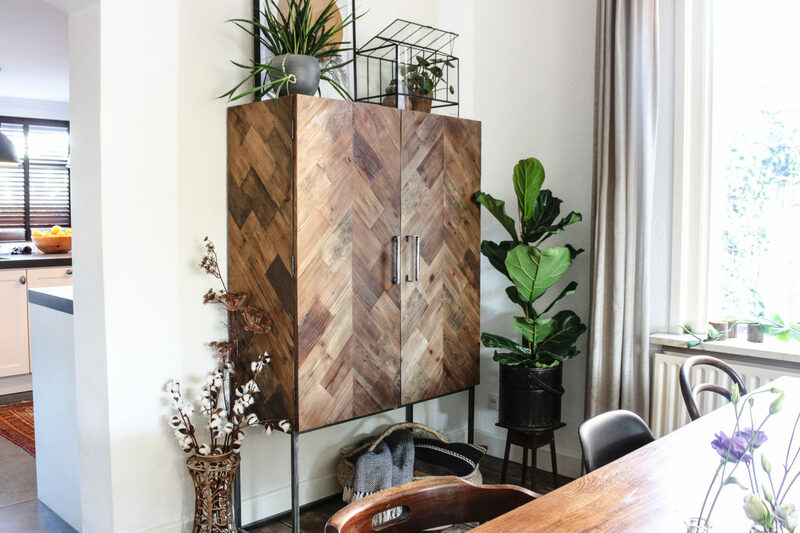 When I visited Riviera Maison lately, I fell head over heels for the gorgeous Tribeca Bar cabinet. 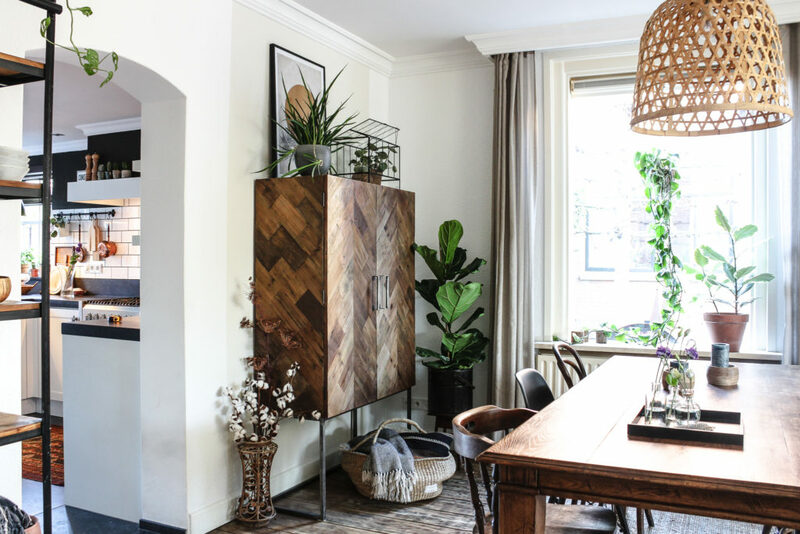 This cabinet is made out of recycled wood in herringbone pattern. High, on steel legs, and totally now. When Riviera Maison approached me for a collaboration, and I, in turn, wanted to discuss participation in our goodie bag for the insta lunch we soon agreed. I was able to receive this gorgeous cabinet. 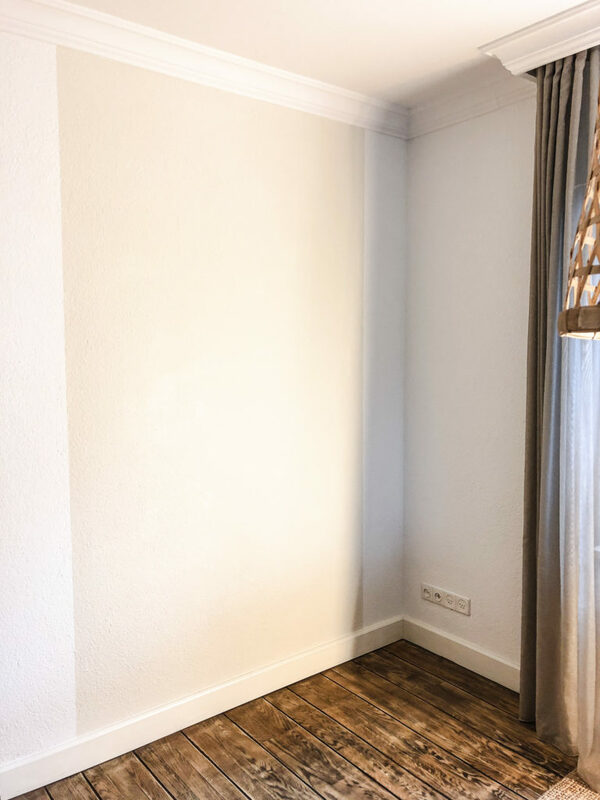 In order to really make this eyecatcher shine in this corner of the dining area, I decided to add a bit of colour to the wall. I initially considered blue but with spring in the back of my mind I chose a soft matte Chalk paint in the colour American egg shell. 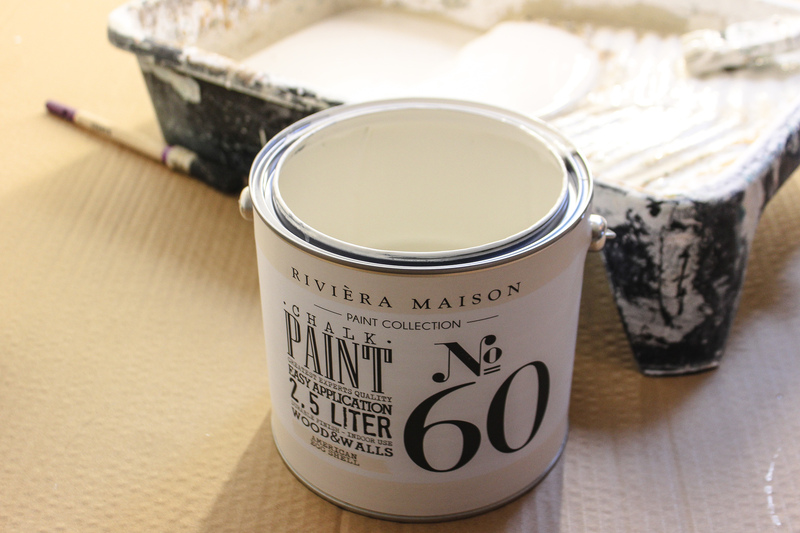 This paint is also Riviera Maison’s and is suitable for walls but also for wooden furniture! I didn’t paint the entire wall but choose to do a section only. I wanted to frame the cabinet, very subtly, and am very satisfied with the final result. I have a bit left so might do something else with it soon! Tip: Paint your wall and an old frame the same colour for a cool effect. Hang the frame without content on the wall. 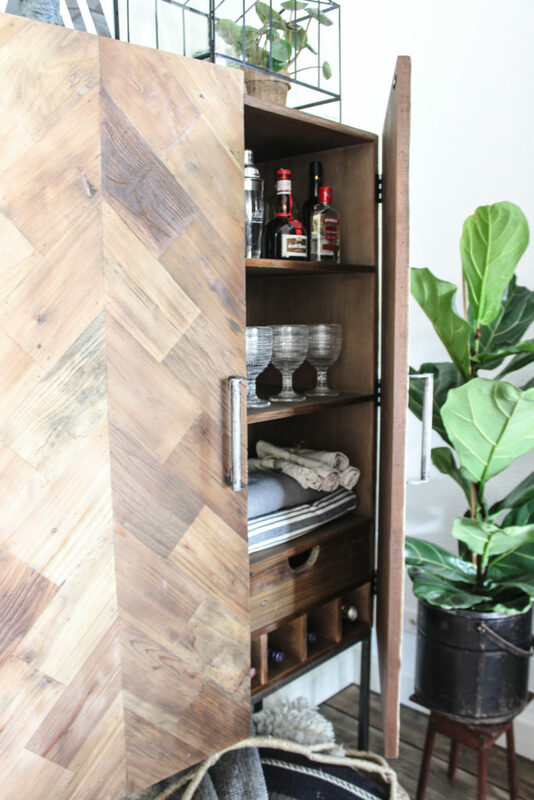 Tribeca bar Cabinet with herringbone pattern. When I finished painting, I put the cabinet in its place and wow! Now it’s in situ I am even more in love with this awesome piece. What really speaks to me is that it doesn’t quite reach the ceiling. 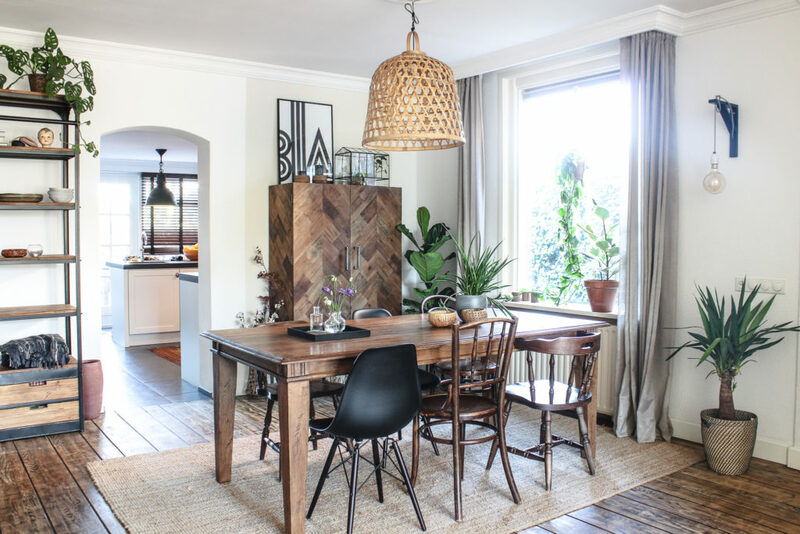 This gives the dining nook even more openness and space. The previous cupboard was also gorgeous but a massive piece of furniture from floor to almost the ceiling. Quite a difference with the Tribeca Bar Cabinet. Also, the herringbone pattern is just divine. Very contemporary. Inside the cabinet you’ll find shelves and the bottom is easy storage for wine bottles. 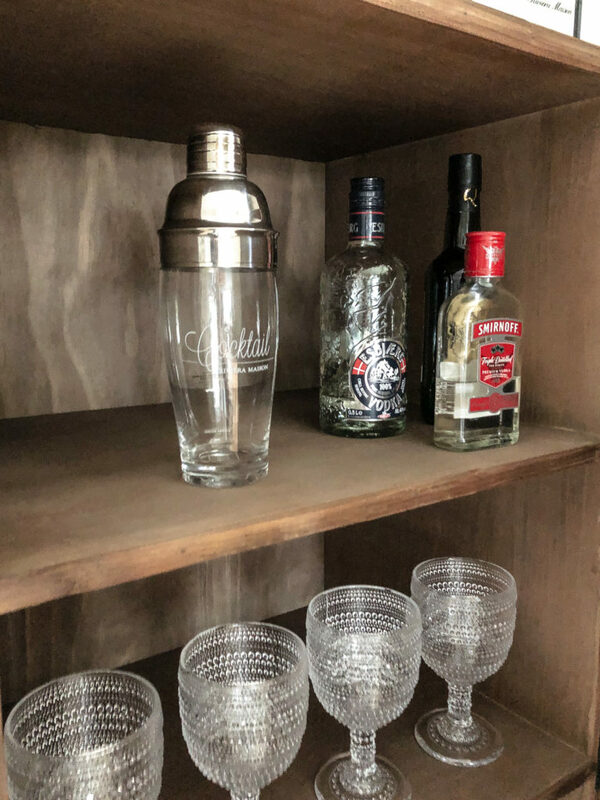 That makes it also very suitable as drinks / crockery cabinet with nice crockery, glassware, and tableware. I’m also going to use it for paperwork. For this I am going to get a few nice storage boxes. I want to keep it nice and tidy! Accessories to finish the look! 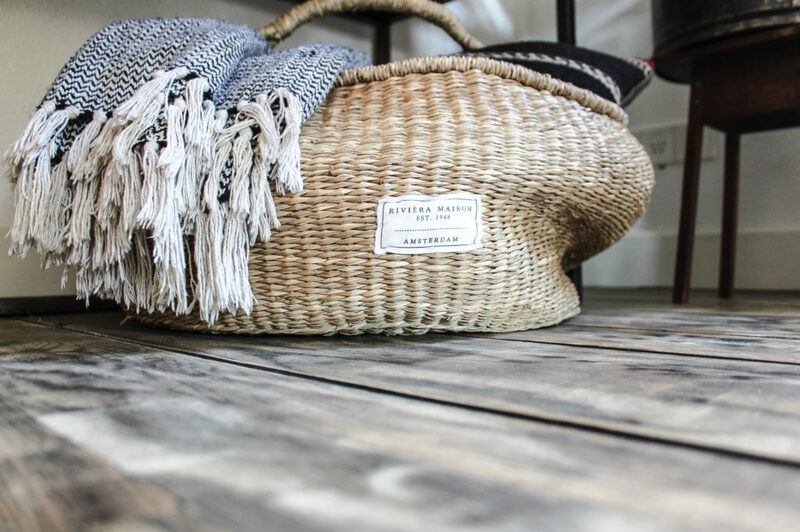 I dressed the dining nook further with a beautiful basket ‘secret bay basket’ made of sea grass. A gorgeous big basket that I use to store a few cushions and plaids. Looks cool too! I think this one will also work well with a plant. I also love the mini ‘Hampstead Greenhouse’. Fab! 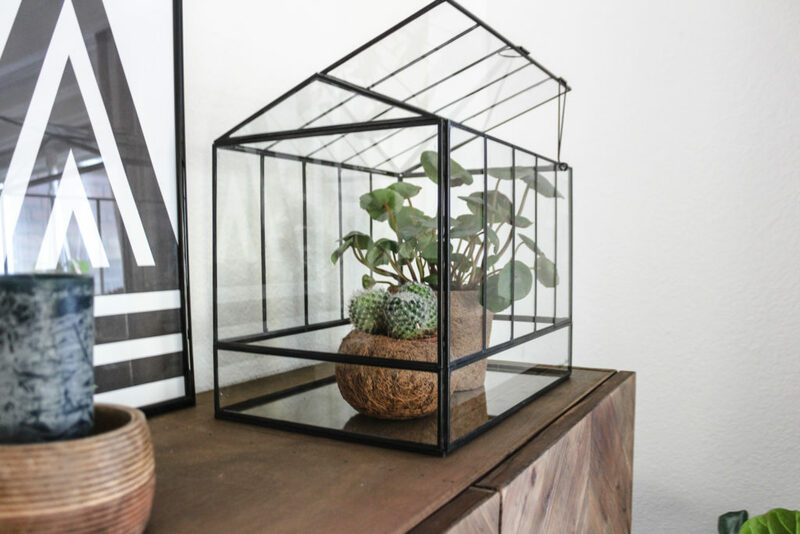 I love greenery and I put a cactus and little pant in here. Both also from Riviera Maison. I also have room on top of the cupboard now, which is a real plus to me. I can vary in style. Whether it is a plant in the mini greenhouse, a few cushions in the basket with plaids or a few cool prints with a vase of flowers. The combinations are endless. I’m a fan, how about you? I am so happy with this cabinet and the cool accessories of Riviera Maison. They gained themselves a massive fan. I can also reveal that we have received some awesome items for the goodie bag for the instagram lunch I am organising too. So, it’s not just me who’s happy, I am also allowed to make fellow instagrammers happy! How cool is that? Do you want to take a look at the new spring/summer collection of Riviera Maison? Visit their website and you’ll find their new collection online. Have fun shopping / browsing!